BatteryBar is a simple, straight-forward, battery meter that monitors the status of your battery and displays your battery's status in the taskbar. 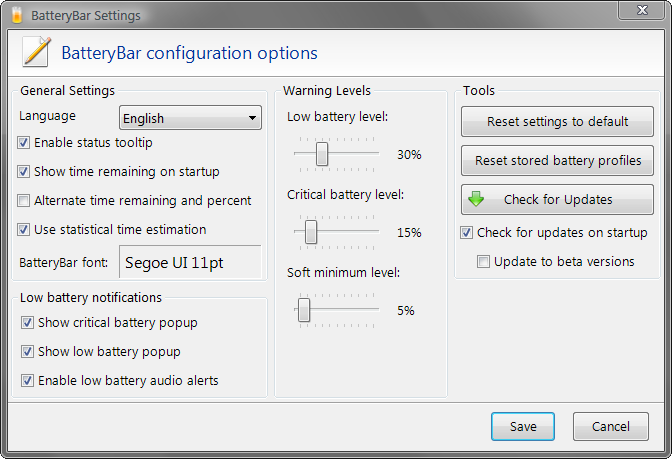 BatteryBar constantly monitors the status of your battery as you use your laptop. As it monitors your battery, it keeps historical data on your battery and provide you with a very accurate estimate of how much time is remaining on your battery. 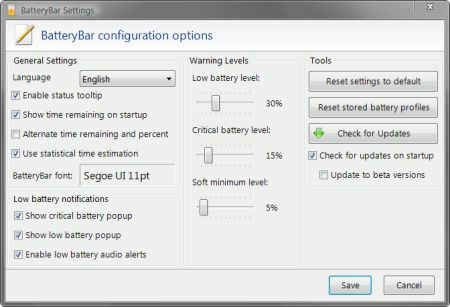 BatteryBar monitors your battery life and when your battery power gets low, BatteryBar will notify you with a popup window and a sound. A second notification window appears when your battery reaches critical level. BatteryBar Pro provides you with the ability to change 20 different settings so that you can customize BatteryBar to your own needs. Copyright 2006-2010 Osiris Development. Template designed by Color Light Studio. Upclick Inc. is an authorized reseller of Osiris Development products.